Uptown Update: Uptown: Most Diverse Community? However, a reader finds the study to be slightly biased, citing comments like: "Uptown’s ranking testifies to the powerful forces that have reshaped it over the past decade. In this neighborhood, institutions struggle to meet the needs of its heterogeneous population, and residents have been pushing hard for policies to protect the supply of affordable housing, which is diminishing as a result of investments catering to upper-income groups." "Overall, this is interesting, and there is some credence in what is being presented; however, without the specific index scoring results, the report is somewhat incomplete (ie - what is the Herfindahl index result for Uptown? This number will reveal the concentration of the different income levels). 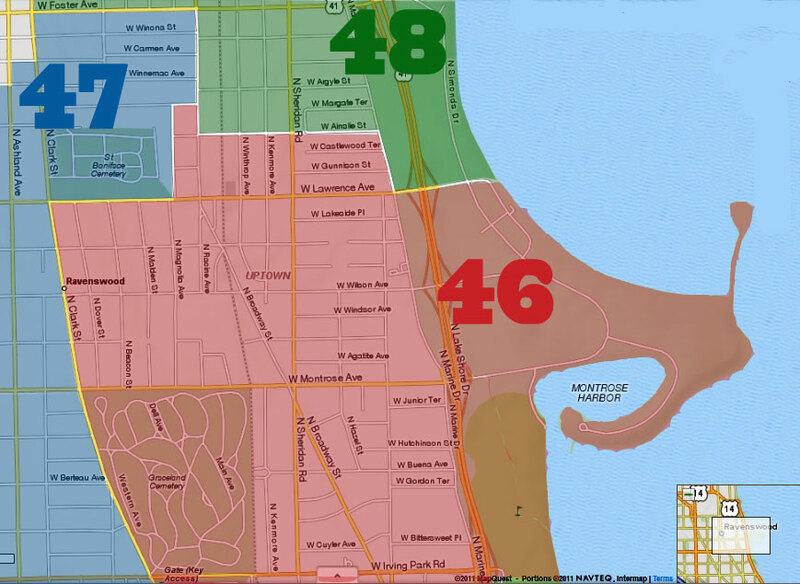 The report mentions that the neighborhoods ranged in the Herfindahl scoring between .35 and .55 without publishing the neighbor-specific results. 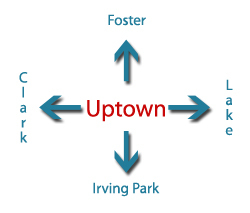 I'm willing to wager that Uptown swings in at the .55, which would indicate a higher concentration of low-income people. It's a nit, but based on the stated positives of income diversity (via early stages of gentrification), if Uptown is at the top of the low-income mix, and more low income is added into the ward (ahem - Wilson Yard), the ranking will trend downward; taking with it the prize of "diversity" as well as the local economy (which is far from robust, at present [ for the last 20+ years). The report mentions positives related to "early stages" of gentrification; but, fails to address how the "late stages" of gentrification add to, or detract from, the overall goal of "diversity". Page 3: "Today, diversity is widely seen as one the city’s most enduring features. In April 2008, Mayor Richard M. Daley cited it as being instrumental to the city’s Olympic bid, declaring 'We welcome immigrants from other lands as we have for generations. Out of our diversity comes our city’s greatest strength.'" Note to Daley: You could have easily replaced "immigrants" with "people"." My point: That "diversity" is simplistically promoted (via a politically correct viewpoint) as a positive ideal or goal or situation, as in "Uptown is the most diverse neighborhood in Chicago!" But the results of Putnam's study give an opposite viewpoint that's worthy of consideration. In fact, Uptown's "diversity" might be its biggest problem, especially among the more law-and-order types who post comments on this blog. Wait, isn't TIF financed housing that costs more per square foot than privately owned housing considered "diversity" of a different stripe? Congratulations Uptown. We did it. If you have a "Mission Accomplished" banner and would be willing to part with it for a short time, I'd be happy to hang this banner for all our passing friends that ride the CTA. His remarks echo the exact point Im trying to make about how many people (secretly) view "diversity." I am not sure I follow your point, BJ, but it is true that neighborhoods with high levels of inequality also tend to have high crime too. I think we are becoming a neighborhood with high levels of income inequality. So, in Uptown we have a lot of racial/ethnic diversity (mostly owing to its historical status as a port-of-entry neighborhood) but we are increasingly moving toward a "dumbell" shaped income distribution rather than a "bell" shaped income distribution. Poor people in Uptown have stayed poor or have moved elsewhere when their incomes have improved. Then new people in similar circumstances have moved in to take their place because of the type of housing options we have. More middle income people (who were living in market rate rentals, for ex.) have been replaced with middle-to-upper income people. That mid-to-upper group seems to be growing. I've said it a thousand times before on this blog but most of the people who were fighting hard to "stop" gentrification were misreading the situation and thus fought for things that have ultimately lead us in this direction. Isn't ECONOMIC diversity what that study was really talking about and not "racial" diversity, which I assume is what a lot of people will read when they see the word "diversity"? If so, why don't they say that since it's an important distinction? Granted, I know just an excerpt was provided, but if that's the gist... It's not simply race and ethinic diversity that leads to lowered voting, less volunteerism. The poor OF ANY RACE probably feel less of a need to participate in the "democratic process" or volunteer or get together for community projects, just as people of a higher level of income probably do those things in higher numbers regardless of their race. "In poorer neighborhoods, the earliest phases of gentrification tend to increase income diversity by creating a more equal mix of rich, middle-class, and poor residents. It is common for “urban pioneers” to bring such diversity, moving to refurbished housing in close proximity to lower-income populations. Indeed, this is now happening in parts of West Town, Rogers Park, Uptown and many other neighborhoods." ... much to the dismay of the alderman, and her cadre of supporters. "At the same time, there is evidence that some blacks have little interest in moving to more integrated neighborhoods. Instead, many high-income African-American residents choose to reside in largely black neighborhoods on the South Side, creating several ethnically homogenous [sic] communities, such as Avalon Park, where the middle- and high-income households outnumber those in the low-income category. In any case, our data as well as previous research suggests that these spatial patterns will remain part of city life for years to come." No surprise, here. The higher-income groups move out, the lower-income groups stay put. IE - high income african-americans may take their incomes out of Uptown, leaving behind their less well-to-do brethren. "Today, local chambers of commerce and community development organizations have grown more sophisticated and rely heavily on citizen input. Grass-roots participation and team-building are seen as crucial steps in the creation of a sense of community. Many community-based organizations, including economic development corporations, have adopted the policy that their advisory boards must mirror the ethnic and racial composition of the residents. In addition many of these organizations mandate citizen input and require participation from residents prior to approving projects." ... one of the "organizations" NOT mandating citizen input, unfortunately, is our local aldermanic office. "As a general rule, our findings suggest that ethnic diversity tends to be strongly correlated with income diversity (the most ethnically diverse areas tend to also have high income diversity)." Again, their findings are based on aggregate scoring. The study DOES NOT reveal the individual scoring of the measures used to base the aggregate results. When mid- to high-income whites cluster in the same neighborhood, it's typically called "racial segregation." But when mid- to high-income blacks do so, they're creating "ethnically homogenous [sic] communities." Well, to be fair, BillyJoe, it is only recently that large groups of mid-to-upper income blacks have had true choices about where they could live. In order for that choice to be available there needed to be some critical mass AND true choice when it came to places to live. We also can assume that a certain % of these people are second generation "mass affluent" blacks (or whatever you'd like to use) and don't want to raise their children in communities like they grew up in (where they were one of only a handful of students of color). I wonder if the study controlled for neighborhoods that were in a transition, i.e. becoming more or less diverse in a relatively short period of time. Without that control I'm not sure if you could associate the quality/quantity of "neighborly feelings" simply with the diversity of the community. I would wager a guess that communities whose diversity remained close to constant (regardless of the level of diversity) would have a much higher quality/quantity of "neighborly feelings" than any neighborhood that was "rapidly" changing.